Salvatore (of Hom) also mentioned Shore Road Bagel & Deli Shore Road Bagel & Deli, where the bagels are huge. We chose 4 flavors: poppy seed, cinnamon raisin, salt, and everything. The oddest thing was that each bagel dough was so different. We broke into the poppy seed first and both frowned in disappointment. It was dry, a little denser, but similar to a kaiser roll. 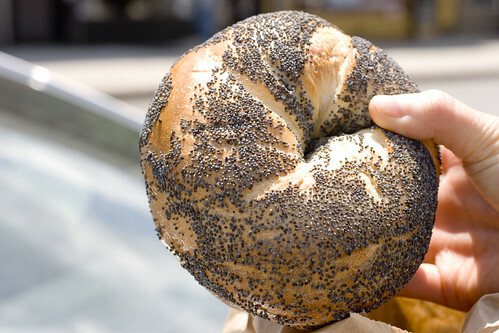 Not at all a proper bagel. Despite being so loaded with carbs already, we programmed the GPS to find Leske’s Danish Bakery Leske’s Danish Bakery, because Allison (of Robicelli’s) told us they were known for black and white cookies. Their Black & White is different than any I’ve had, the black and white parts are frosting, not the glossy fondant I’m used to seeing. 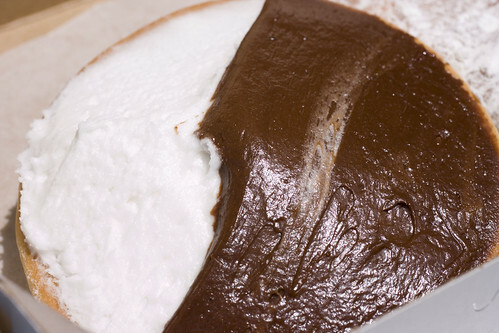 The frosting is pretty standard vanilla and chocolate, similar to what you’d find on a cupcake, but the cake-like cookie is fresh and delicious. It’s dense but bounces back and still feels light. There will be a next time, because the two treats were a steal for $2.65, and because real bakeries are going extinct in New York. Please help save them! This is a completely no frills place, reminiscent of the ones I went to growing up in Queens, none of which are still there. So please, stop eating mass produced desserts and help keep real bakeries alive! posted by jessica	at 08:37 AM	Filed under Coffee, Tea, and Dessert, Restaurants. You can follow any responses to this entry through the RSS 2.0 feed. Both comments and pings are currently closed. I like Brooklyn’s The Bagel Store. Yummy cream cheeses and new flavored bagels – specially good around the holidays (pumpkin, ginger, and peppermint!). 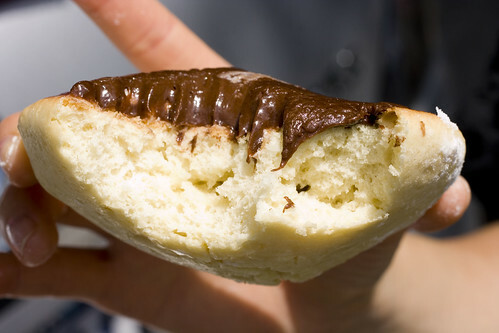 oh my gosh – that bagel is so big! i wonder how you’d feel if you ate some of san diego’s bagels. Next time you’re down in these parts, check out Bagel Boy on 81st and 3rd. When I went to college in Boston, I’d make my mom ship me up a dozen every month in my care package. They would be days old by the time I got them, and then I’d keep them in the freezer so they’d last til my next shipment, and they were STILL better than any fresh bagel I could get in Boston. Though if you’re coming down for carbs, I’d rather you check out the bread from St Anthony’s Bakery. Besides, the weekend lines at Bagel Boy are insane. 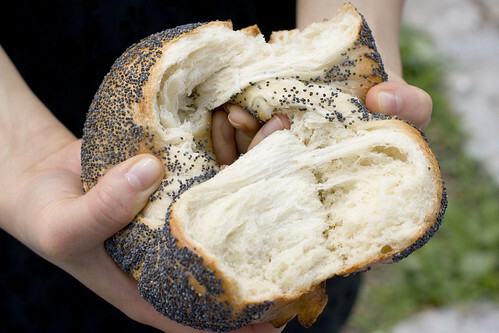 Waw,..the bagel is so big & it all loooks so delicious! Yum yum yum!! That bagel is too big. 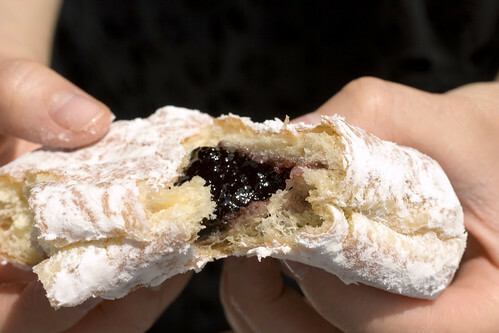 Without the proper ratio of surface are a to volume, you lose the essential quality of bagelness. Absolute Bagels on Broadway and 107th is tops in my book right now.